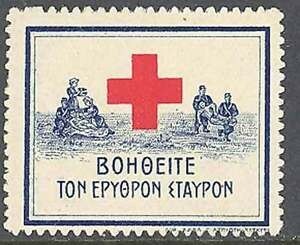 Charity tax stamps were designated for compulsory additional use at certain times of the year. 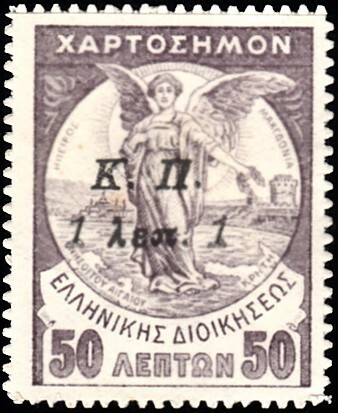 They were issued in 1914 and 1915. 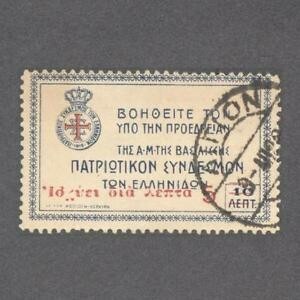 There was a 1915 issue in the name of the Greek Women's Patriotic League. The use of these was not compulsory but were supplied by charities to postal officials who were allowed to retain 10% of the value sold over the counter; the balance was paid by the post office to the charities. A key figure in Greek politics in the early twentieth century was Eleftherios Venizelos. Elected several times as prime minister he is largely credited with the modernisation of the Greek state and had a profound influence on its internal and foreign affairs. 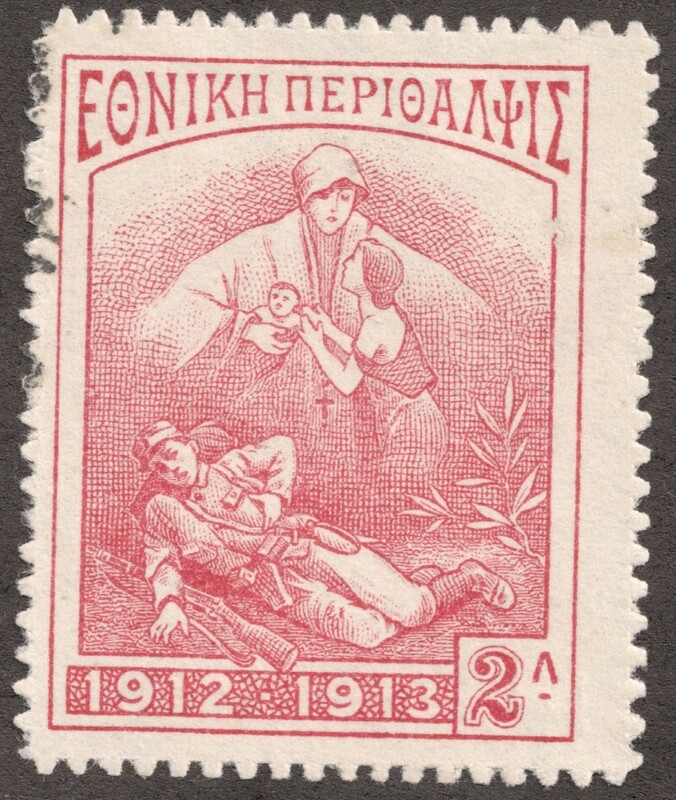 Following the success of Greece in Balkan Wars he brought Greece into World War I on the side of the Allies. However he was also strongly anti-monarchist and this brought about what became known as the National Schism. For a time the Venizelists and the Royalists were rival power blocks, the Venizelists assisting the Allies in Thessalonica and the Royalists' actions seen to be helping German-Bulgarian forces. Civil War appearing imminent, in June 1917 King Constantine I and his eldest son were forced into exile by the Entente Powers (UK, France and Russia) and the Venizelist government. Alexander, Constantine's second son, was made effectively a puppet king but even so he supported Greek troops and the territorial extent of Greece increased considerably by the end of the Great War and the early stages of the Greco-Turkish War of 1919-1920. Alexander died from septicemia in 1920 following a monkey bite, and his father was restored to the throne. 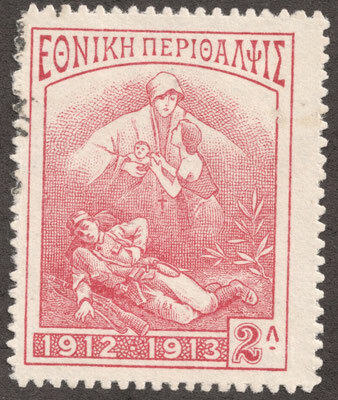 In 1917 the new Venizelist government issued their own postage stamps. Later in 1917 there was an issue overprinted K.P. (Kolnonike Pronea - Social Providence). This represented an extra tax part of the proceeds of which went to those who had suffered from the war blockade. 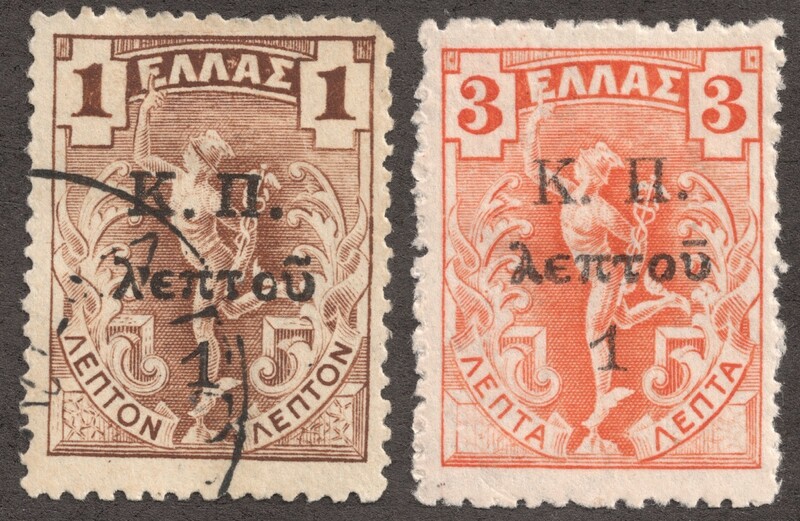 In 1916 a separate Royalist issue of stamps was issued, overprinted with a red crown, for use in central and southern Greece controlled by Royalist forces. 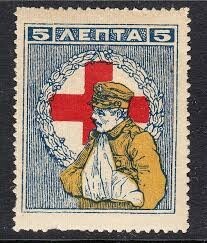 In 1918 there were two further issues for the Red Cross and the Patriotic Charity League. The Dodecanese Islands consist of twelve small islands in the south-east Aegean Sea together with the larger island of Rhodes. In 1912 they declared independence from Turkey but were occupied by Italy in May 1912 during the Turco-Italian War. Italian possession was recognised under the Greco-Italian Agreement of 1920. In 1947 they were transferred to Greek administration. 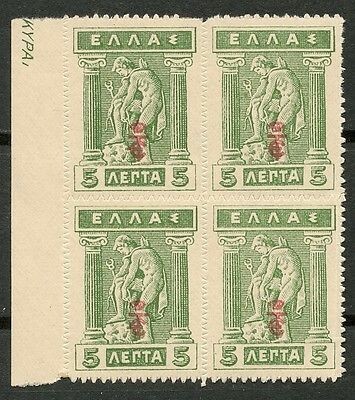 Throughout the period 1914-18 Italian stamps were used with overprints.